Currently approved club makers are; St Andrews Golf Co and Tad Moore Hickory Classics. If you are a maker and you wish to be added to this list of approved makers please contact us at 0267-42-4413. Currently approved ball makers are; McIntyre Golf Company. If you are a maker and you wish to be added to this list of approved makers please contact us at 0267-42-4413. The World Hickory Open Championship Committee representatives in Japan, Cuthbert & Co, will be the sole judge as to which clubs and balls are permitted at the Japan Hickory Open Championship events and their decision will be final. Many of the players will not have played hickory golf before and therefore, do not have hickory handicaps. 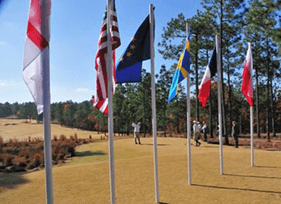 We will follow the World Hickory Open and the US Hickory Open handicap conversion rules. Japan Handicaps will be adjusted as follows. The maximum Japan Handicap is 20. Therefore, the maximum adjustment is + 6 for a Hickory Handicap of 26. 6: All players with a handicap of 21 or above will play using the Japan Happy Hickory Golfers points system (similar to the Stableford system) for a separate range of prizes. This is designed for all new and experienced hickory golfers to enjoy playing hickory golf. Cuthbert & Co is the Japan representative for the World Hickory Open Championship.